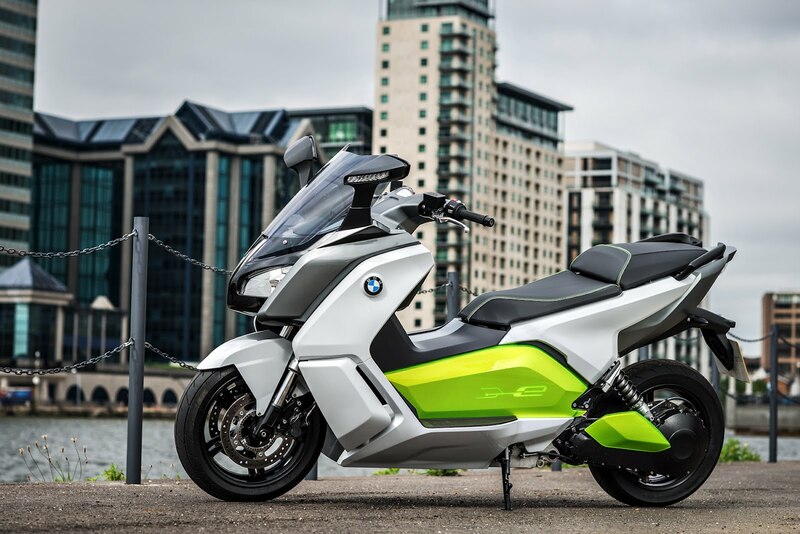 BMW have released official information about their upcoming electric scooter, dubbed the C evolution. Based on last year's E-Scooter concept, this new electric two-wheeler was unveiled just ahead of BMW's internal combustion C 600 Sport and C 650 GT maxi scooters, which will hit U.S. showrooms this fall. An official launch date for the C evolution has not been released, but BMW indicates it could come to the U.S. as early as 2014. With 11 kW continuous output (homologation according to ECE R85 to determine motor outputs) and 35 kW peak output, the “C evolution” has a powerful motor and provides a high level of riding fun. The top speed is electronically limited to 120 km/h. The scooter supremely handles motorway riding and overtaking – even with a passenger. It is also capable of effortless hill starts on steep slopes with a pillion passenger. In terms of acceleration from 0 to 60 km/h, it comfortably holds its own against current maxi scooters a capacity of 600 cc or more. Compared to conventional combustion engines, the electric drive of the “C evolution” also offers significant advantages at low speeds in particular. Thanks to elaborate power electronics settings, the alternator offers the rider an instant, spontaneous response. There are no delays in torque build-up at all as are typical in combustion engines due to the clutch engaging and disengaging. At 8 kWh, the storage capacity of the battery is extremely generous and ensures a range of up to 100 kilometres. This means that realistic zero-emissions riding in the big city and in urban environments is no problem at all. As in other areas, BMW Motorrad has been able to draw on synergy effects with BMW automobiles here. For example, the “C evolution” uses the same lithium-ion storage modules as are installed in the BMW i3. Here, developers paid particular attention to the quality and service life of the storage modules so as to ensure that the range is preserved even after many years of service life and in very cold weather. While in electrically powered cars a cooling agent is normally used to cool the battery, air cooling is used in the “C evolution” in order to save space and weight. The heat of the high-voltage battery is dissipated by means of an aerodynamically optimised cooling air shaft at the centre of the battery casing through which there is a constant flow of air. To ensure optimum heat dissipation, the battery base has longitudinally arranged cooling ribs. 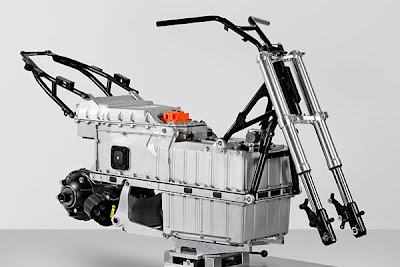 Electric drive via drivetrain swing arm with tooth belt and planetary gear. The “C evolution” is powered via a drivetrain swing arm. The alternator is positioned behind the battery casing and integrated in the swing arm. Due to the proximity of the alternator output shaft and the swing arm axle, the moment of inertia around the swing arm centre of rotation is minimised. This also provides optimum suspension/damper settings and a sensitive response. The secondary drive is via a tooth belt from the alternator to the rear belt pulley on the output shaft. From here, power is transferred to the rear wheel via a planetary gear. The total gear reduction is 1:8.4, while the maximum rotational speed of the alternator is 10,000 rpm. The alternator and power electronics are liquid-cooled. BMW Motorrad has conducted lengthy road tests to develop a form of recuperation which is unique in single-track vehicles and very transparent for the rider. The “C evolution” is ridden in exactly the same way as a scooter with combustion engine. The rider does not have to actively initiate energy recuperation since the vehicle does this automatically whenever possible. For example, energy recuperation commences when the throttle grip is closed and – as in a combustion engine – the generator function of the alternator creates drag torque which depends on the degree of recuperation. The drag torque generated by the alternator is like the familiar “engine brake” that takes effect when removing the accelerator with a combustion engine. The car-type charging socket – currently the only one of its kind in an electrically powered two-wheel vehicle – is located behind a cover in the footwell at front left. The charge cable required is housed in a storage compartment on the right-hand side of the footwell. It is fitted with a mains plug to fit the respective national system. The fact that the charge socket is the identical to the car standard has the advantage that the “C evolution” can be charged at charge stations throughout the USA with integrated charge cable and standardised plug, for example. 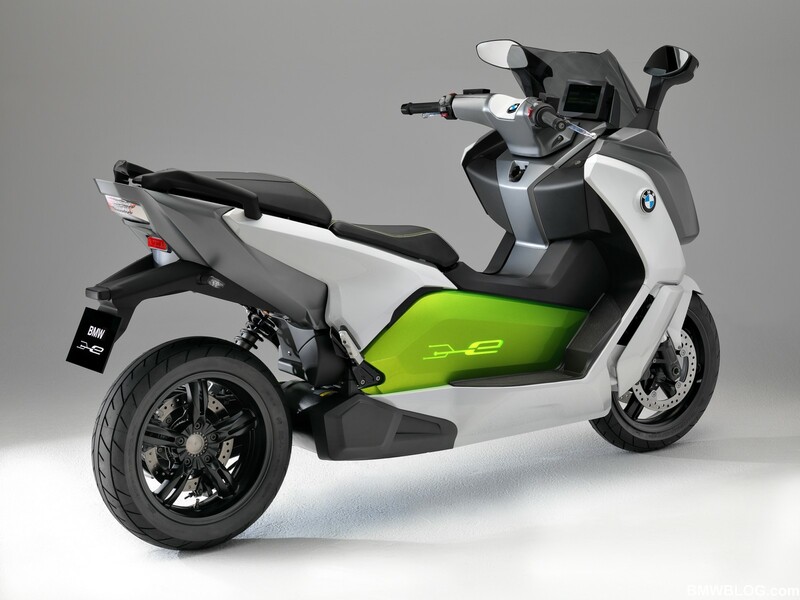 This technology is not currently offered by any other electrically powered two-wheeler. Charge cables with the relevant specifications will be offered in later serial production models so that they can be charged at stations in Europe. Unlike existing maxi scooters with combustion engine, the “C evolution” does not have a main frame in the usual sense. The aim of chassis development for the “C evolution” was to combine the best possible directional stability at high motorway speeds with agile handling in urban traffic. Engineers also set out to make full use of the advantages provided by an extremely low centre of gravity – due to the low position of the battery. For this reason, chassis design is based on a torsionally stiff hybrid composite structure made up of a load-bearing, torsionally rigid battery case made of cast light alloy with integrated mounting for the single-sided drivetrain swing arm. Bolted onto this are the steering head support and the rear frame in steel tubing. In urban traffic in particular, the riding experience is characterised by extremely light handling and excellent slow-running properties. The weight of the vehicle is at a level comparable to maxi scooters with a combustion engine. At the front, the “C evolution” rolls on a 5-spoke light alloy die-cast wheel, size 3.5 x 15 inches, while the size of the rear wheel is 4.5 x 15 inches. In order to reduce rolling friction and thus make the most efficient use of the electrical energy stored, the “C evolution” has lightweight tyres. These are special Metzeler Feelgreen tyres with optimised rolling resistance in the sizes 120/70 R15 at front and 160/60 R15 at rear. The tyres were developed with two clear aims in mind: environmental compatibility and high efficiency based on minimising rolling resistance, at the same time providing a higher mileage. Rolling resistance was reduced by 25 per cent as compared to the Metzeler Feelfree tyres. At the same time, the Metzeler Feelgreen tyres are very light, with reduced hysteresis response and a new tread with specially created tread grooves for optimised rolling resistance. 2-piston floating calipers ensures powerful, safe deceleration. At the rear there is a single disc system also with a diameter of 270 millimetres and 2-piston floating caliper. In order to achieve a stable pressure point and optimum controllability, all brake lines are steel-wrapped. A high level of active safety is ensured by the BMW Motorrad ABS. Weighing just 700 grams and extremely small in size, the Bosch 9M dual channel ABS allows separate regulation of the two brake cycles for front and rear brakes. However, the ABS software has also been adapted so as to control the recuperation process in line with the specific requirements of the “C evolution”. As in the BMW Motorrad maxi scooters C 600 Sport and C 650 GT, the hold brake is activated automatically when the side stand is folded out.